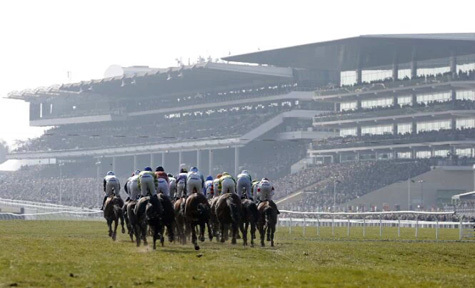 On another fine day at Cheltenham the course Going was officially Good. The back marker from the start was Footpad about three to four lengths behind the main field at the first fence. Big McIntosh made all the early running gaining a lead of three to four lengths over Let’s Dance by the second hurdle. Following behind came Clan Des Obeaux, Who Dares Wins, Sceau Royal, Apple’s Jade, Frodon, Ivanovich Gorbatov, Gibralfaro, Zubayr, Connetable, Leoncavallo, Consul De Thaix, Tommy Silver and lastly Footpad. As Big McIntosh remained at the head of the field Ivanovich Gorbatov kept a steady 8th/9th position in the pack. With three to go Apple’s Jade had caught the leader Big McIntosh with Gibralfaro in third. Only two from home and Ivanovich Gorbatov still remained further back in the field but was moving quickly to reduce the three length lead advantage that Apple’s Jade had with B J Cooper on board. Also finding space to travel through the field showing a deft touch was Ruby Walsh on Footpad. At the final flight Ivanovich Gorbatov was challenging Apple’s Jade out in front whilst Footpad had gone from last to third between the seventh and final fence! Ivanovich Gorbatov took victory by 1 ¼ lengths as 9-2 race favourite. In second came Apple’s Jade at 12-1 six lengths ahead of Footpad in third at 5-1 2F odds. SternRubin was off and running first along with Zamdy Man and an eager Great Field making the front three going into the second flight. 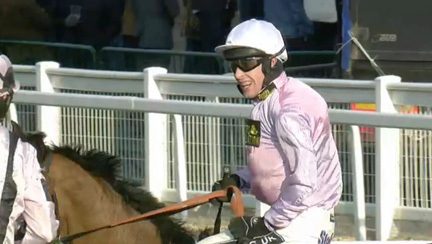 MontBazon was a faller here and jockey Wayne Hutchinson received treatment as the race continued. This resulted in the final hurdle being by-passed but thankfully Hutchinson was able to walk off the course unaided. With six to go Superb Story was about half way down the field but travelling well alongside All Yours and Draco, as Great Field held the front position with SternRubin and Zamdy Man on the shoulder. Three out and Wait For Me was making ground and Superb Story was going strong. By this point SternRubin had taken the lead with Fethard Player moving into second and Great Field slipping to third. With only one hurdle remaining Superb Story managed to manoeuvre between SternRubin and Fethard Player to take them on. At the finishing post Superb Story at 8-1 was victorious by 2 ½ lengths over 33-1 Fethard Player. Three and a half lengths behind 33-1 SternRubin was third just a head in front of fourth placed 7-1 JF Wait For Me. Up For Review and Barters Hill met the first flight ahead of the field and formed a four horse wall with Atlantic Gold and Allysson Monterg by the second. With a circuit remaining the front of field read Up For Review, Barters Hill, Champers On Ice, Atlantic Gold, Allysson Monterg, Jonniesofa, Definite Outcome, Aurillac with UNoWhatIMeanHarry and Fagan off the pace. 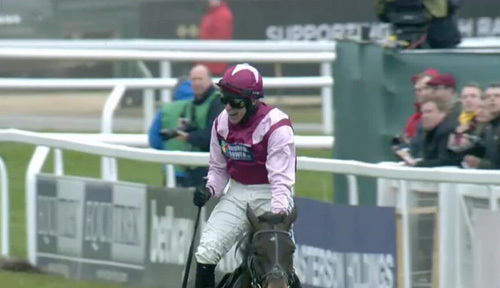 Long Dog ridden by Ruby Walsh took a bad tumble before the eighth from home and Bleu Et Rouge fell with five to go. UNoWhatIMeanHarry and Fagan had made great progress travelling through the field and occupied third and fifth place respectively two from home, as Champers On Ice took on the unbeaten Barters Hill as they charged for the final flight. Jockey Ruby Walsh standing beside the final fence indicated to the riders to move wide as they jumped, possibly due to something on the course he felt had caused his horse to stumble. On landing the last hurdle with the home straight looming it was UNoWhatIMeanHarry that had a small advantage over Barters Hill as Champers On Ice and Fagan followed. At the finishing post 1 ¼ lengths separated 11-1 UNoWhatIMeanHarry and 33-1 Fagan in second place. One and a half lengths behind the front two 20-1 Champers On Ice was third 1 ¾ lengths ahead of fourth placed Barters Hill at 4-1 2F odds. At the first flight Smad Place blundered but kept poll position at the head of the field. With 15 to go Smad Place led O’Faolains Boy, Djakadam, Don Cossack, Cue Card, On His Own, Carlingford Lough, Don Poli and Irish Cavalier the back marker. Ten from home Smad Place had a two length advantage over O’Faolains Boy with Don Cossack, Djakadam and Cue Card forming a front five grouping, whilst Don Poli lagged around eight lengths behind amongst the others. But the early fast pace had a telling effect as Smad Place and O’Faolains Boy began to fade. Cue Card was challenging going into the third last fence but fell heavily leaving Don Cossack and Djakadam to fight for victory. As Brian Cooper drove his charge forward he opened up a three to four length advantage over Djakadam between flights 21 and 22. 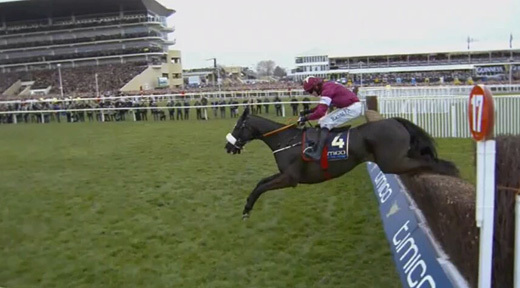 In the finishing home straight 9-2 Djakadam kept fighting but couldn’t reign in the 9-4 race favourite Don Cossack. The winning distance was 4 ½ lengths and ten lengths behind Djakadam in third place came Don Poli at 9-2 odds. Victoria Pendleton the Olympic cycling champion having taken up horse riding was aboard Pacha Du Polder in this race. She was last in the field beside Need To Know going into the first flight. Pendleton had slightly improved Pacha Du Polder’s position to third last followed by Morito and Camden with 13 to go. After the first circuit the main running order was Alskamatic, Major Malarkey, Current Exchange, Paint The Clouds, Impact Area, Cave Hunter, Richmond and Pacha Du Polder was fifth last at this point. Major Malarkey had gained a five length lead over Alskamatic ten from home and On The Fringe was around twelfth going into the back straight. Camden pulled up with about seven fences remaining. Five out and Major Malarkey had increased his advantage to around seven or eight lengths with Current Event in second Alskamatic third and Mendip Express fourth. But two horses not really in any contention so far were fast making up ground On The Fringe and Morito. Although Major Malarkey still had a good lead two from home against Current Event by the final flight On The Fringe and Morito were piling on the pressure and eating up the ground. At the finishing post 13-8 favourite On The Fringe won by a neck over 14-1 Marito. A length behind Paint The Clouds the 9-2 2F was third and Current Event at 14-1 odds came in a further length back. Pacha Du Polder having picked off the competition came in a credible fifth. Winner: Ibis Du Rheu 14-1 by 1 ¼ lengths over Second: Flying Angel at 8-1 2F odds. 1 ¼ lengths behind in Third: Sky Khan 50-1 six lengths in front of Fourth: Tully East at 50-1 odds. Winner: Solar Impulse 28-1 by 3 ¾ lengths over Second: Dandridge 8-1 J2F just half a length in front of Third: Rock the World 9-2 F by 1 ¾ lengths over Fourth: Savello at 25-1 odds. Lovely clear blue skies and sunny conditions greeted race goers today with the official ground Going as Good (Good to Soft in places). 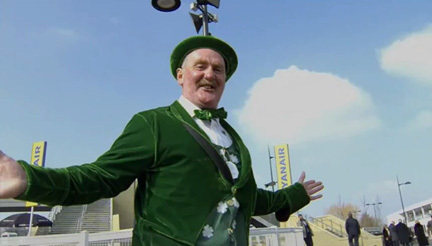 Will St Patrick bring more luck to the Irish this week? Drama unfolded when a standing start resulted in Zabana not even beginning the race but unseating its jockey instead. 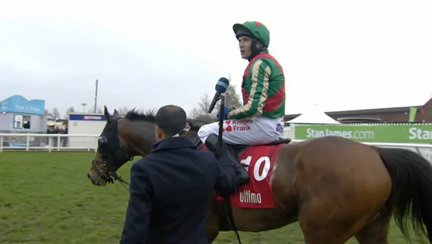 Davy Russell had his back to the starter at a ninety degree angle, and was making a turn when the race got underway. Outlander was severely impeded as well but did manage to get going. 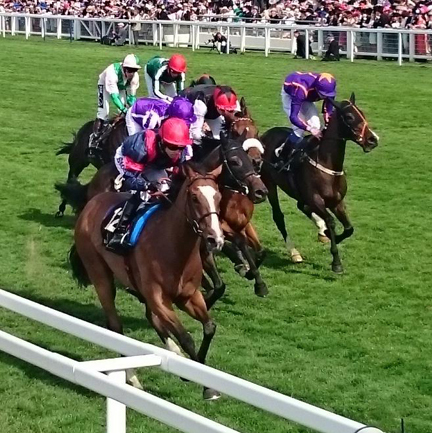 The early back markers were Three Musketeers and As De Mee with Bristol De Mai and Black Hercules meeting the first hurdle ahead of the field. With twelve to go Bristol De Mai led Mount Gunnery followed by Black Hercules on the inside, Outlander, Garde La Victoire, L’Ami Serge and the two back markers. Loose horse Zabana ran across the front of the field going into the back straight but didn’t cause too much trouble mercifully. Three fences later Three Musketeers at the back began to show signs of improvement in the race, whilst Black Hercules joined Bristol De Mai at the front. Garde La Victoire and Outlander were fallers four from home. The running order going into the next fence was Bristol De Mai, Black Hercules, L’Ami Serge, Three Musketeers, As De Mee and Mount Gunnery. L’Ami Serge who was travelling wide cut across Black Hercules at the second last hurdle due to a tendency of jumping toward the left. With L’Ami Serge now on the rails Black Hercules had the space to accelerate toward the last flight unhindered by the remainder of the field. At the finish Black Hercules a 4-1 joint favourite took victory by three lengths over the other 4-1 joint favourite Bristol De Mai. A length behind in third place came L’Ami Serge at 8-1 odds. 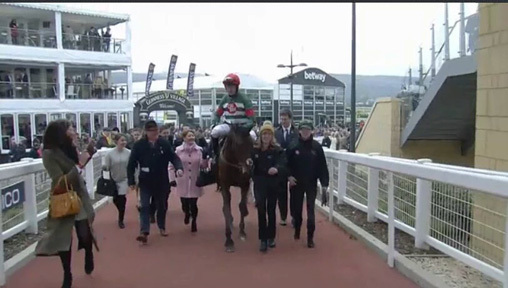 Black Hercules gave jockey Ruby Walsh his fiftieth Cheltenham Festival winner. Flintham made most of the early running and had a six length advantage at one point over Rolling Maul. With nine fences to go Western Warrior made a bad mistake and was last but one in the field with only Box Office behind. The front two remained the same with four to go as If In Doubt picked up on the outside and the field began to reduce Flintham’s leading margin. Mall Dini was going better two from home as Flintham looked vulnerable and under pressure. At the finish Mall Dini at 14-1 odds had a ¾ length winning margin over 14-1 Arpege D’Alene, only a head in front of 10-1 If In Doubt. One and a half lengths behind Taglietelle at 14-1 came in fourth. 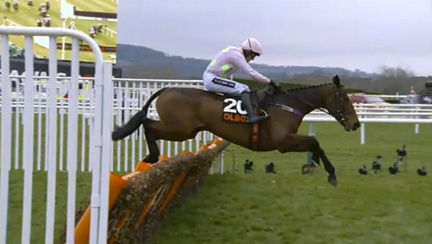 At the first fence Vautour held the sixth or seventh spot whilst Captain Conan and Oscar Rock were the back markers. With fourteen jumps to go Dynaste, Oscar Rock and Champagne West were at the rear of the field as Village Vic and Road To Riches strode out in front. Vautour travelling nicely on the inside was third followed by Smashing, Al Ferof, Josses Hill and Gilgamboa. The head of the field remained much the same and by eight from home Valseur Lido was beginning to make headway and was placed around eighth. With four jumps remaining Vibrato Valtat fell and Vautour had a half length advantage over Road To Riches at the front followed by Al Ferof, Village Vic and Valseur Lido. At the final turn two from home Vautour accelerated gaining a three length lead over Road To Riches with Al Ferof and Valseur Lido behind. With every stride Vautour’s pace increased and he was a worthy evens favourite winner by six lengths ahead of Valseur Lido at 11-1 just half a length ahead of Road To Riches the 7-2 2F. 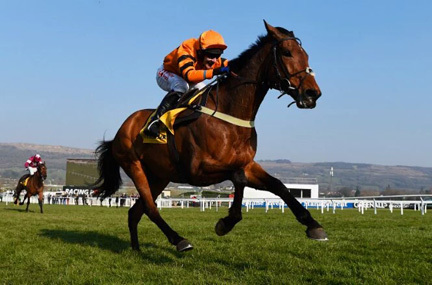 With nine to go the running order was Cole Harden, Kilcooley, Martello Tower, Bobs Worth, Saphir Du Rheu, At Fishers Cross, Whisper, Alpha Des Obeaux, Thistlecrack, Knockara Beau, Aux Ptits Soins and Lieutenant Colonel the back marker. Two fences later and Thistleback had moved into fourth place having powered through the field. Three from home and third placed Kilcooley and Lieutenant Colonel both made mistakes, recovered but fell from any contention. At this point Cole Harden had a ¾ length advantage over Thistleback and at the second last fence both horses jumped together alongside Alpha Des Obeaux. Thistleback then surged toward the final flight and the finishing post unchallenged and secured victory by seven lengths as evens favourite. 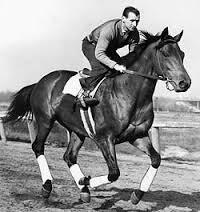 Alpha Des Obeaux at 8-1 was second and twenty two lengths behind Bobs Worth at 33-1 rolled in third. The standing start in this race went much better than in the first. Sadly NiceOneFrankie suffered a fatal accident during the race. Winner: Empire Of Dirt 16-1 by four lengths over Second: Tango Du Juilley at 33-1 by 1 ¼ lengths over Third: Kings Palace 11-1. A further 2 ½ lengths behind in Fourth: Full Shift at 7-1. Winner: Limini 8-11F by 4 ½ lengths over Second: Dusky Legend 50-1 by 2 ½ lengths over Third: Bloody Mary 7-1 just a half length in front of Robins Reef at 25-1. Winner: Cause Of Causes 9-2 2F by a massive 12 lengths over Second: A Good Skin at 14-1 just half a length ahead of Third: SilverGrove 16-1. Five lengths behind in Fourth: Knock House at 16-1. 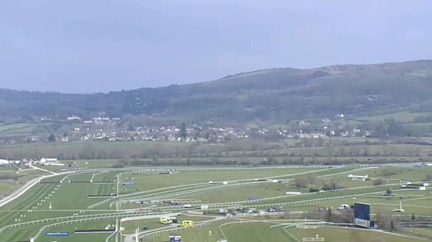 The weather looked bright and sunny at Cheltenham today with the course Going described as Good (Good to Soft in places). Thomas Hobson took the initiative from the start with Its’AFreeBee alongside and with eight to go AToiPhil, OO Seven and Ghost River were bunched just behind the front two runners. Not a great deal changed in this order as the race progressed although with six jumps remaining Thomas Hobson had pulled a two length advantage over Its’AFreeBee. It was at this point with a circuit to go that Yala Enki pulled up. OO Seven on the inside rail had to fight for room with AToiPhil directly alongside and Ghost River pushing on the outside, but all three horses still had Its’AFreeBee and Thomas Hobson narrowly out in front with four hurdles left. The back marker from the start remained Vigil. With three flights to go and the field tightly bunched Yanworth was forced to travel on the outside as Ghost River and Bello Conti kept him wide. 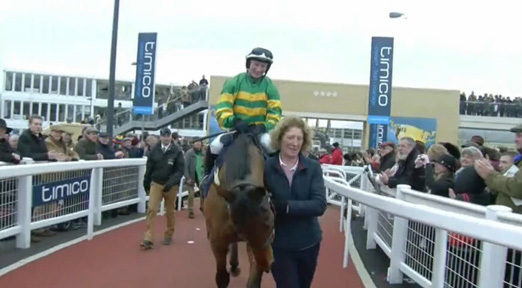 Yanworth looked to be in eighth place with about three jumps left as only two horses were travelling behind. A slight error at the third last obstacle didn’t help Yanworth at a time when Yorkhill tucked on the inside found the space to travel with ease toward the front. At the last flight Yanworth landed about four lengths behind Yorkhill and although the horse battled right to the line the gap couldn’t be closed completely. Yorkhill at 3-1 2F odds took victory by 1 ¾ lengths over 11-10 favourite Yanworth. Seven lengths behind ItsAFreeBee came in third at 33-1. SeeYouAtMidnight took the lead going into the first with Le Mercurey in second and Roi Des Francs third. 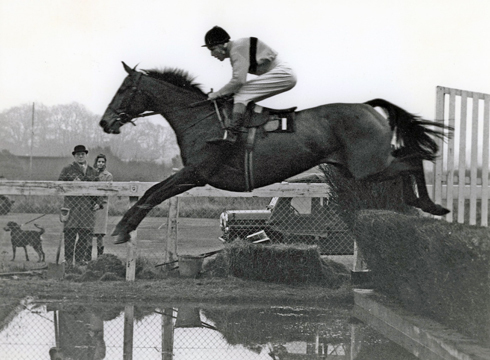 On the first circuit going into the water jump SeeYouAtMidnight still made the running with Roi Des Francs and Le Mercurey having swapped places. Just behind came Blacklion then Vyta Du Roc on the inside, No More Heroes out wide with More Of That tucked behind, and Shaneshill the back marker of the field. With nine to go Shaneshill remained detached from the field with More Than That narrowly ahead. A four horse wall comprising of Vyta Du Roc on the inside, Blacklion, No More Heroes in the middle and Le Mercurey out wide blocked the back two’s progress whilst vying for contention. Four from home all the horses jumped well and No More Heroes was in a good position to make a move. With three flights remaining Shaneshill was making up distance and closing fast, and No More Heroes landed ahead of the field. At the turn going into the home straight Roi Des Francs and No More Heroes were out in front, Vyta Du Roc had fallen off the pace and More Of That, Shaneshill and Blacklion were fighting hard for third, fourth and fifth places. Roi Des Francs pulled up suddenly and No More Heroes pushed in front two from home. But the advantage was lost at the final obstacle when No More Heroes landed awkwardly, head down with legs not seeming quite so steady. This gave Blacklion and Shaneshill the opportunity to go past and fight for victory. Blacklion at 8-1 managed to win by half a length over 16-1 Shaneshill a horse that had eaten up the ground in the latter stages of the race, and could possibly have won had it not occupied the back marker position for so long. Five lengths behind Shaneshill came third placed More Than That the 6-4 race favourite. After the race No More Heroes was given extensive treatment for a serious tendon injury and early reports suggested the horse had been put down, but at the time of writing treatment continues for the horse. More Of That was reported to have suffered a burst blood vessel. The first five horses to reach the first obstacle were Beast Of Burden, One For Harry, Baron Alco, Ubak and Blazer in fifth. Going into the fourth flight Baron Alco was ahead of Ubak followed by Hunters Hoof, Beast Of Burden and Blazer whilst Politologue began to get more involved in the race. Diamond King was running well in the middle of the field as was Long House Hall travelling out wide but fast. Three out Beast Of Burden fell off the pace and at the turn for the home straight Blazer put on a chase closing down Baron Alco and Ubak the front runners. At the last jump Ubak and Long House Hall at the head of the field leapt close together but Diamond King on their inside with a huge effort bypassed the two on landing and thundered toward the finishing post, securing victory by 1 ¼ lengths at 12-1. Long House Hall at 16-1 edged into second place by a neck with 28-1 Ubak in third just half a length in front of fourth placed Blazer an 8-1 2JF. 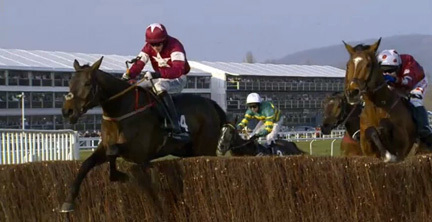 Sizing Granite nearly fell at the first hurdle and never quite recovered pulling up with six jumps remaining. Special Tiara and Un De Sceaux took to the front from the start and Sprinter Sacre was running well in third with eleven to go. Special Tiara landed awkwardly at the third fence but kept going to maintain a half length advantage over Un De Sceaux with Sprinter Sacre around two lengths further back. Not far behind the third horse followed Somersby, God’s Own and Dodging Bullets. Special Tiara was forced wide on the corner three from home as Un De Sceaux nudged ahead. 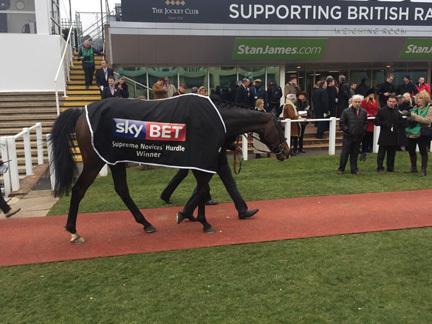 But Sprinter Sacre was in a position to move as well and by the second last hurdle had gained a four to five length lead. 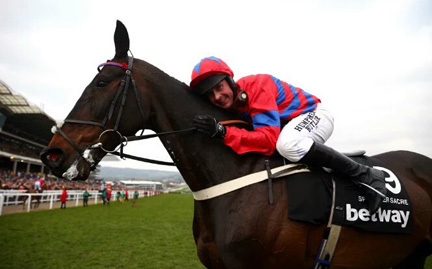 A massive cheer roared from the huge crowd as ten year old Sprinter Sacre with a heart condition that kept him off the track for two years strode to victory. The horse won by 3 ½ lengths at 5-1 2F odds whilst Un De Sceaux the 4-6 race favourite battled to take second place by a nose over 16-1 Special Tiara. Valadom went into an early lead and stayed there before running out of steam with four jumps to go. Fifteen year old Uncle Junior was the early back marker. With 25 fences remaining Love Rory had moved to second with Any Currency third and Balthazar King sixth. The first six horses were strung out in front with Valadom having a four length advantage over Love Rory after twelve jumps. Balthazar King was a faller with around 17 to go (described by TV commentators as the second fence of the cheese wedge!). With ten obstacles remaining Valadom still led with Any Currency in second but Love Rory running in third suddenly pulled up and was out of the race. Three fences later and Josies Orders had moved into fifth place and Bless The Wings was travelling well. Four from home Valadom began to fade, Any Currency took the lead and Third Intention was looming large. With only one jump to go both Josies Orders and Quantitativeeasing were hitting a good run and Bless The Wings was making an impact too. At the final flight Any Currency and Bless The Wings were together with Josies Orders flying toward them. Victory by a length went to 11-1 Any Currency with Josies Orders the 15-8 favourite taking second place. Just 1 ¼ lengths behind Bless The Wings was third at 33-1 and five lengths back Quantitativeeasing was fourth at 9-1 odds. Winner: Diego Du Charmil 13-2 2F won by a head over Second: Romain De Senam at 20-1 odds just a half length in front of Third: Coo Star Sivola at 16-1. In Fourth: Missy Tata at 10-1 was 3 ¼ lengths behind the third horse. 5.30 Weatherby’s Champion Bumper (Standard Open National Hunt Flat) (Grade 1): Distance 2m 87y: Fences unknown: 23R NR King Uther. Winner: BallyAndy 5-1 2F won by a nose over Second: Battleford at 25-1odds two lengths in front of Third: Bacardys at 16-1 odds just a length ahead of Fourth: Castello Sforza 11-1. 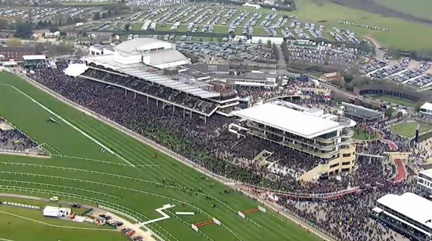 Huge crowds gathered for the first day of the Cheltenham Festival where the course Going was officially Good to Soft (soft in places). The front three runners virtually throughout were Charbel, Min and Supasundae with Bellshill holding an early fourth place. Altior was around seventh in the field with six hurdles remaining. Charbel and Min took a two length lead ahead of the field on the back straight. Meanwhile Beveur D’Air had only five horses bunched behind it four from home but began to travel well through the field. On the turn going into the home straight Altior showed a turn of foot to pass Min as Charbel began to fade. Going into the final flight Altior was accelerating past Min as Supasundae faded from any contention. Altior thundered toward the finishing post showing no signs of deceleration to win by seven lengths a 4-1 2F winner. 15-8 favourite Min was second 1 ½ lengths ahead of Beveur D’Air at 10-1. Altior gave trainer Nicky Hendersen his first Novice Hurdle success since 1992 and Nicky became the first English winning trainer of the race since Donald McCain with Cinders and Ashes in 2012. Going into the third flight Sizing John, Douvan and Fox Norton held the front three spots in the field. With seven to jump Douvan had the edge over Sizing John with Vaniteux in third place just nudging ahead of Fox Norton. The Game Changer and Baltimore Rock followed the front four with Aso as the back marker with three jumps remaining. From here Vaniteux tried to accelerate on the outside of the front runners but fell on landing at the second last flight along with Baltimore Rock. Douvan remained untroubled by the fallers and won easily as the 1-4 race favourite by seven lengths ahead of 9-1 Sizing John in second 3 ¾ lengths in front of 33-1 Fox Norton in third place. 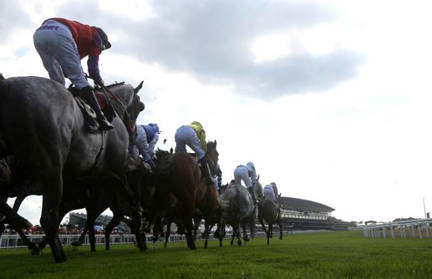 Winner: Un Temps Pour Tout 11-1 seven lengths ahead of Second: Holywell at 8-1 2F odds. Nine lengths behind in Third: The Young Master 14-1 just a length in front of Fourth: Morning Assembly at 10-1. All the jockeys in this race were subsequently given a one day ban for anticipating the start. From the start Annie Power looked incredibly poised out front and never really came under any threat from the rest of the field. With three flights to go and about five furlongs out My Tent Or Yours was second followed by The New One and Nichols Canyon running in the slipstream of Annie Power. 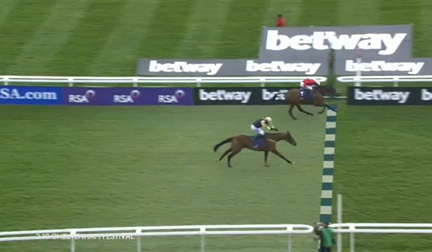 Going into the final hurdle Annie Power had a clear three length advantage over My Tent Or Yours and Nichols Canyon both battling for the minor placings. 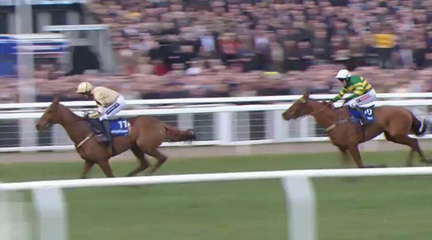 At the finish Annie Power the 5-2 race favourite took victory by 4 ½ lengths over 10-1 My Tent Or Yours just a head in front of Nichols Canyon at 15-2. 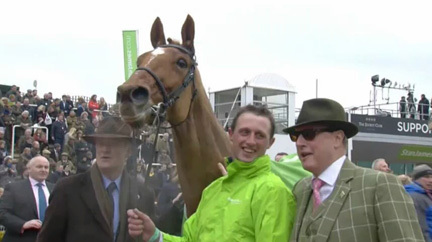 Annie Power became only the fourth mare to win this race and the first since the Flakey Dove success of 1994. Annie Power had tasted defeat in her previous two attempts in this race having suffered a fall at the final flight last year. 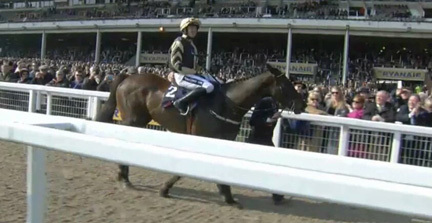 Great credit must also go to the second placed My Tent Or Yours running again after 702 days off the track. Desert Queen, Aurore D’Estruval and Melbourne Lady took the initiative at the race start with Vroum Vroum Mag travelling in the middle of the field. With seven to go Stephanie Frances was the back marker and around five lengths separated the front two runners. Desert Queen kept a small advantage at the back straight whilst Vroum Vroum Mag stayed about twelve lengths off the pace. 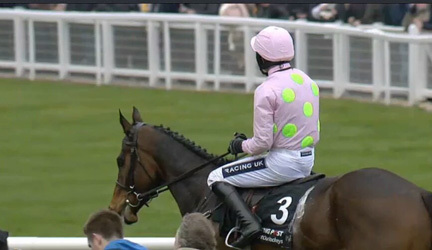 However the horse was jumping well despite an anxious moment when Vroum Vroum Mag was sandwiched between Pass the Time and Aurore D’Estruval, and jockey Ruby Walsh looked unsteady in the saddle. Between the second last and final flight The Governess was allowed to let rip by the jockey and showed a quickening pace whilst Vroum Vroum Mag comfortably eased along in contention. Unfortunately The Governess took a heavy fall at the final jump which proved to be fatal. Vroum Vroum Mag at 4-6 F odds won by 2 ¾ lengths ahead of Rock On The Moor at 66-1. Just a half length behind 40-1 Legacy Gold took third with a length advantage over 80-1 Pass The Time. Winner: Minella Rocco 8-1 by 1 ¼ lengths ahead of Second: Native River 7-1 2F. Six lengths behind in Third: Measureofmydreams 9-1 and five lengths further back Fourth: Southfield Royale 5-1F. Queen Anne: 1. Solow 11-8 F, 2. Esoterique 16-1, 3. Cougar Mountain 16-1. Margins 1 L, Nk, and 2 L.
St James’s Palace: 1. Gleneagles 8-1 JF, 2. Latharnagh 25-1. Margins 2 ½ L, ½ L and 2 ¾ L.
Ascot: 1. Clondaw Warrior 5-1 F, 2. Fun Mac 8-1, 3. Elishpour 25-1, 4. Noble Silk 20-1. Margins ½ L, 1 ½ L, and 2L. Jersey: 1. Dutch Connection 14-1, 2. Fadhayyil 9-1, 3. Bossy Guest 8-1 J2F, 4. TVP1 14-1. Margins ½ L, ¾ L, Hd. Prince of Wales Stakes: 1. Amazing Maria 25-1, 2. Rizeena 7-1 J2F. 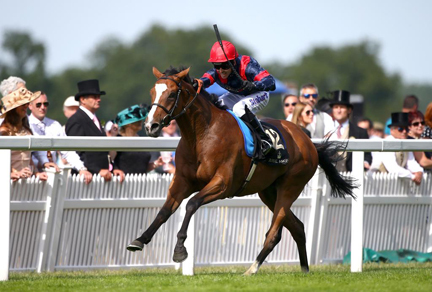 Margins 2L, 2L, 2 ½ L.
Royal Hunt Cup: 1. Gm Hopkins 8-1 2F, 2. Temptress 9-1, 3. Chil The Kite 16-1, 4. Balty Boys 25-1. Margins Nk, 1 ½ L, ½ L.
Norfolk: 1. Waterloo Bridge 12-1, 2. Log Out Island 13-8 2F, 3. King of Rooks 11-8F. Margins ½ L, ½ L and ½ L.
Britannia: 1. War Envoy 10-1, 2. Udododontu 14-1, 3. Sacrificial 28-1, 4. Carry on Deryck 33-1, 5. Rotherwick 20-1. Margins Nk, 1L, ¾ L.
King George V: 1. Space Age 9-1, 2. Scottish 7-1, 3. Marma’s Boy 16-1, 4. King Bolete 9-2 2F. 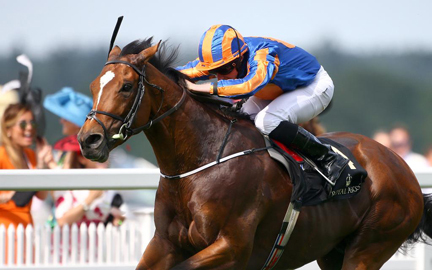 Margins 1 ¼ L, ¾ L and ½ L.
Albany Stakes: 1. Illuminate 4-1F, 2. Ashadihan 12-1, 3. Elegant Supermodel 20-1, 4. Fireglow 20-1. 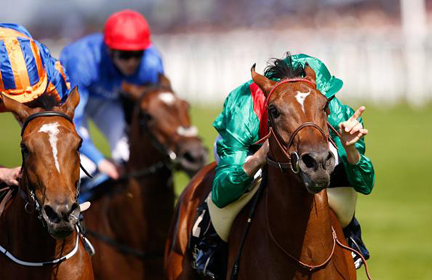 Margins 1 ½ L, ShHd, 3 ¼ L.
King Edward VII Stakes: 1. Balios 3-1 2F, 2. Mr Singh 8-1. Margins 1 ¼ L, ¾ L and 1 ½ L.
Commonwealth Cup: 1. Muhaarar 10-1, 2. Limato 9-2 2F, 3. Anthem Alexander 8-1, 4. Salt Island 33-1. Margins 3 ¾ L, ¾ L and ShHd. Queens Vase: 1. Aloft 5-2F, 2. Tommy Docc 33-1, 3. Future Empire 12-1. Margins ½ L, ½ L and ½ L.
Wolferton: 1. Mahsoob 7-4F, 2. Sennockian Star 12-1, 3. Fire Fighting 16-1. Margins ½ L, Hd, Hd. Hardwicke: 1. Snow Sky 12-1, 2. Eagle Top 2-1 2F, 3. Postponed 7-2. Margins 3 ¾ L, Nose and 3 ¼ L.
Queen Alexandra: 1. Oriental Fox 4-1, 2. Taws 25-1, 3. Teak 10-1. Margins 7L, ½ L and 2 ½ L.
Beautiful weather greeted the throngs of race goers attending the festival this week, with rain only clouding the final races on the last day. The official course going was Good to Firm (Firm in places) and regular watering of the ground (5mm on three consecutive nights) was required to keep the course in pristine condition. When Snow Sky romped home to win the Hardwicke on the final day it gave trainer Sir Michael Stoute his ninth victory for the race. 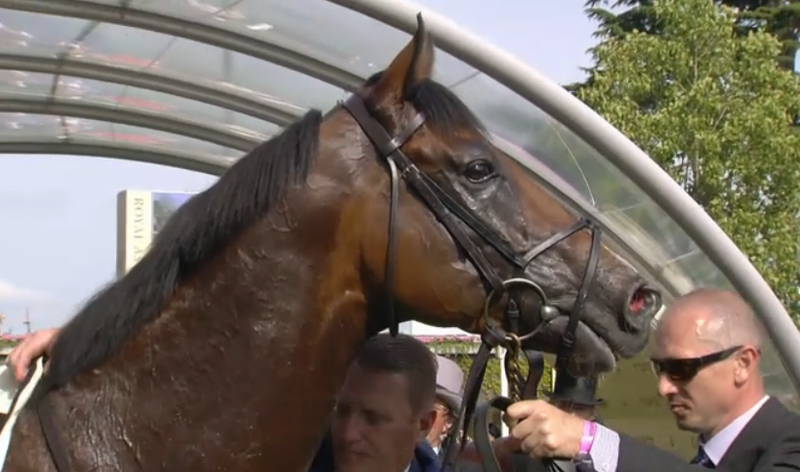 Ryan Moore broke the post-war record of number of wins at Royal Ascot when he secured his ninth and final victory of the week aboard Aloft in the Queen’s Vase on day four. Not surprisingly this amazing achievement seen Ryan named most successful jockey of the meet. There were nine unbeaten fillies from a field of 18 in the Albany on day four. 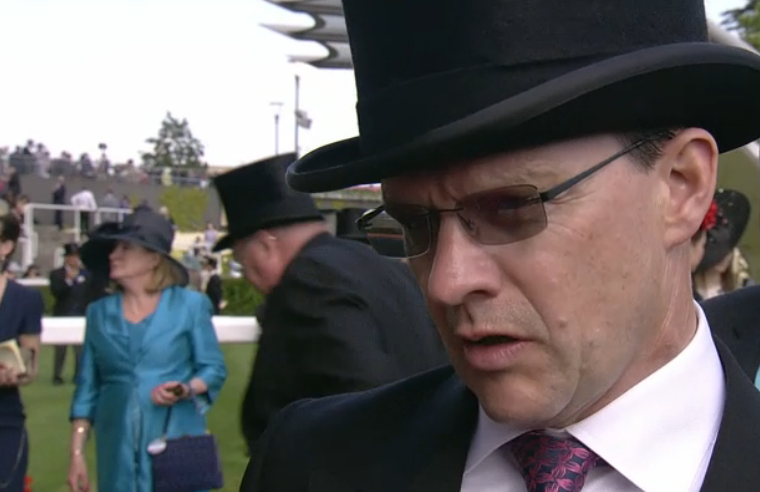 Ryan Moore secured his eighth win at Royal Ascot (on only the third day) aboard War Envoy in the Britannia Stakes. He has become the only jockey to reach this number since 1989 when Pat Eddery achieved the same feat. The only other post-war jockey to get eight wins in a Royal Ascot week was Lester Piggott in 1965 and 1975. Trainer Aidan O’Brian watched his horse Gleneagles win the St James’s Palace Stakes giving him a record seventh victory in the race. 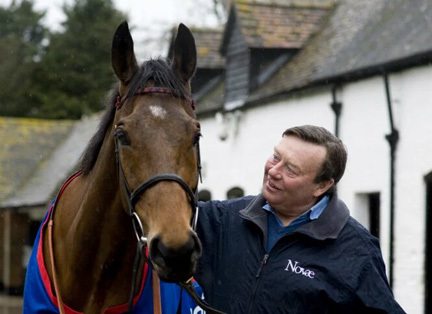 At the end of the week O’Brian received his seventh award as most successful trainer for the festival. The biggest winning margin of the week was seven lengths when Oriental Fox and jockey Joe Fanning romped home ahead of Taws in the very last race of the meeting. The win gave trainer Mark Johnston his first victory in the Queen Alexandra. The Chesham at seven furlongs is the longest race of the week for two-year-olds. 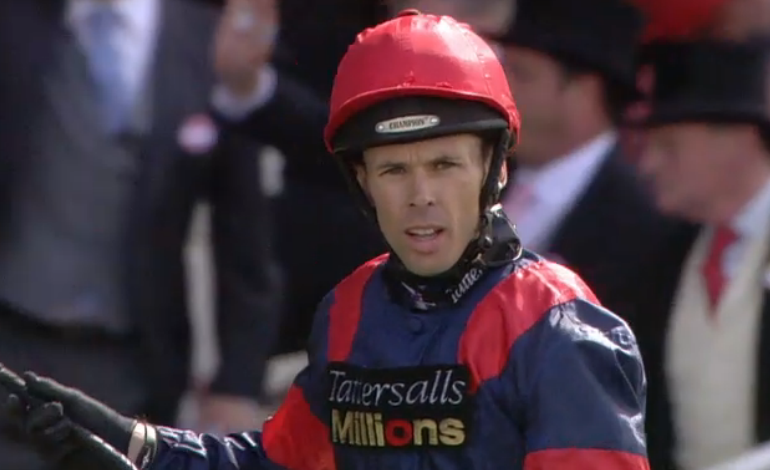 Six different jockeys’ tasted success on the last day of racing and Ryan Moore surprisingly wasn’t one of them. Royal Ascot is an incredible five day festival consisting of thirty races showcasing the best in British flat horse-racing. The smallest field for the week seems to have been in the St James’ Palace where victorious Gleneagles only had four other competitors. 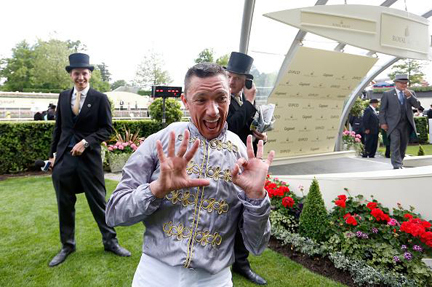 With the last race on day two of the meeting jockey Frankie Dettori secured a 50th Royal Ascot victory on board Osaila. He now forms an illustrious quartet with Lester Piggott, Willie Carson and Pat Eddery who have achieved this milestone in their racing careers. 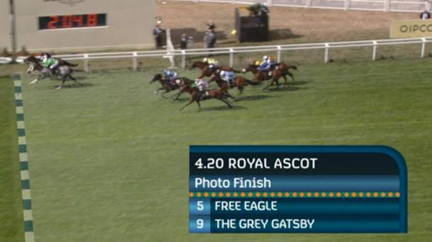 Free Eagle had only run four previous races before securing victory in a photo-finish with The Grey Gatsby in the Duke of Cambridge. It was four wins from four when Mahsoob was first past the post in the Wolferton. There were four photo-finishes over the five days of racing: King’s Stand, Duke of Cambridge, Sandringham and the Chesham. Not surprisingly the shortest winning margin came from one of these races, and the accolade went to Osaila winning the Sandringham by a nose. 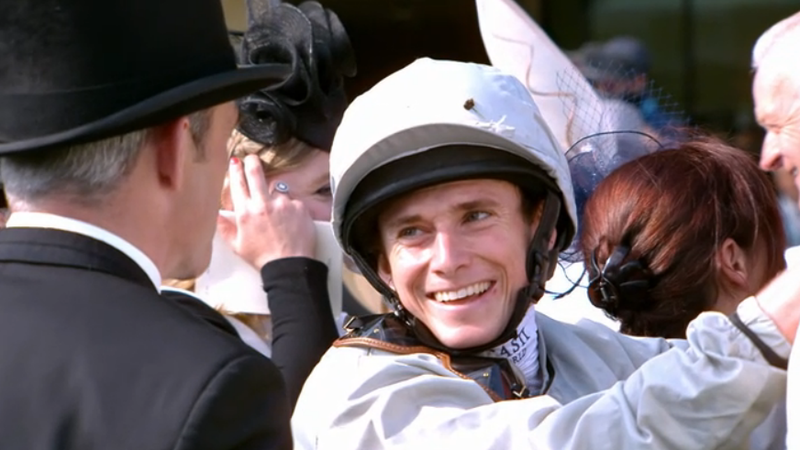 On day one jockey Ryan Moore began his Royal Ascot Week with a terrific 54-1 treble, riding Gleneagles, Clondaw Warrior and Washington DC to victory in the final three races. He got another treble with Waterloo Bridge, Curvy and War Envoy on day three at 786-1 odds. The GOLD CUP is only one of three races where the victor keeps the winning trophy, a Gold Cup being made especially each year. It was a good week for Frankie Dettori with three wins: Osaila, Time Test and Undrafted. Father and son trainers Barry and Charlie Hills watched their horses take first and second place in the Jersey Stakes. Son Charlie’s horse Dutch Connection secured victory over Barry’s horse Fadhayyil. Ryan Moore only managed a double on day two with Acapulco and Gm Hopkins. In the Queen Anne Stakes it was a French double with Solow and Esoterique. Jockey Christophe Soumillon got his second ever win of the meeting when he rode Ervedya to victory in the Coronation Stakes on day four. Ironically Christophe’s 2015 win was the only time he had success at Ascot, as his previous success in 2005 was in York as Ascot was being re-developed. Jockey Richard Hughes got a 34-1 double (Illuminate 4-1, Arab Dawn 6-1) in his last Royal Ascot taking his career tally for the meeting to 30 victories. He is retiring from the saddle to take up the reins of training. The final furlong can be a dangerous place and Spark Plug had an awful fall when his legs were clipped in the Royal Hunt Cup? Thankfully both horse and jockey Jimmy Fortune seemed ok afterwards. Trip to Paris gave trainer Ed Dunlop his first win of the GOLD CUP. Jockey Graham Lee possibly became the only rider to win the GOLD CUP and the Grand National having ridden Amberleigh House to victory at Aintree in 2004. It was Graham’s first ever win at Royal Ascot too. War Envoy in the Britannia on day three secured a first career victory since debuting in April 2014. 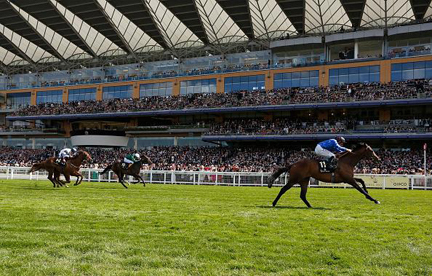 Jockey Cristian Demuro achieved his first ever Royal Ascot win with Suits You in the Chesham. 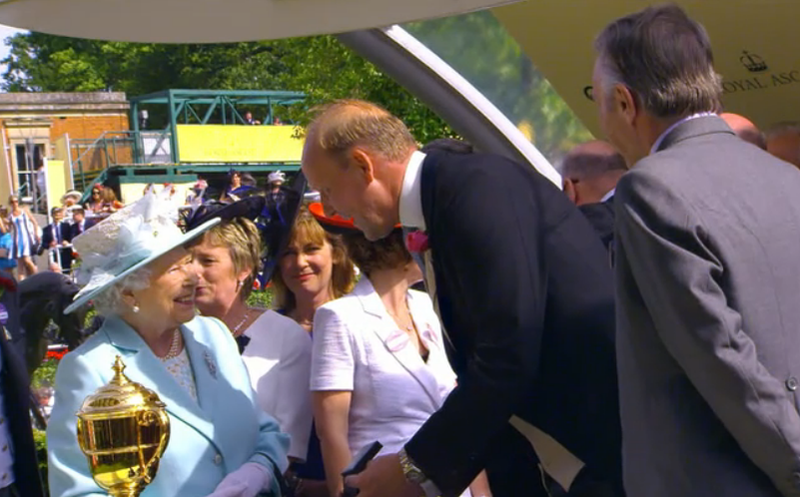 The horse also gave trainer Eoghan O’Neill his first ever Royal Ascot victory too. Day four seen the FIRST EVER Grade One race for Three year-olds taking place and the race was called the Commonwealth Cup. Many great horses raced this week but I was personally disappointed that American horse California Chrome and Michael Owen’s horse Brown Panther couldn’t take part through injury. 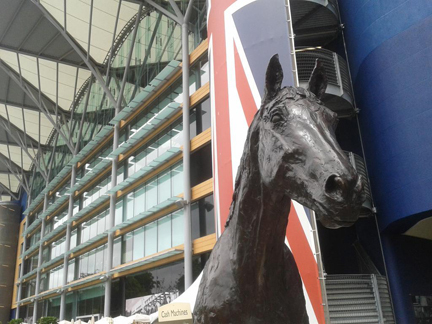 The Queen Alex is a stamina sapping course and the longest race in the British flat calendar with a distance of 2m 5 ½ f.
As well as the fantastic racing over the festival a highlight on day one was the unveiling of a statue of Frankel.